Here’s another blogsite that I stumbled upon which I have been enjoying recently. On a cold miserable night, is there anything better than settling down with a bottle or six of your favourite amber nectar and watching a good movie? Or even a bad movie – I’m not too fussy! 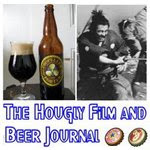 It seems that Lee at The Hougly Film and Beer Journal shares my sentiments. Not only does he review the films that come his way, but also his favourite tipples…you can even watch the beer reviews on Youtube. To get loaded, click here.